A global debt crisis threatens to trigger a stock market crash in 2019, and too many people are unaware. Worldwide debt has increased twofold over just the past 15 years, an increase of nearly $15 trillion. This past July, the Institute of International Finance warned that global debt jumped the most in more than two years. Debt increased $8 trillion just in Q1 of 2018 to reach a mind-boggling figure of $247 trillion. This figure represents an amount equal to a staggering 318% of gross domestic product globally. Imagine your household borrowing to the tune of three times your annual paycheck. Your lenders would not be pleased. By the end of November, the United States alone owed $21.79 trillion, and the interest by itself is projected to grow by $310 billion annually if nothing happens to slow the damage. And when anyone is drowning in debt, someone has to pay – and that is going to end up being you, the taxpaying public. There's no easy way out of this debt crisis. According to the latest World Economic Outlook report issued by the International Monetary Fund (IMF), the future could be bleak. 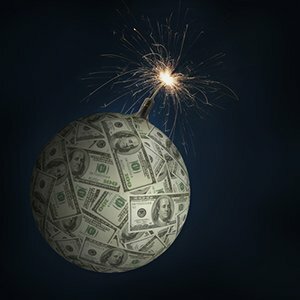 After countries printed money and slashed interest rates to combat the 2008 financial crisis, there could be limited resources available in the future to address another economic crisis. We're already seeing warning signs in the bond markets. In September of this year, the 10-year Treasury benchmark rate jumped from 2.06% to 3.06%, a 50% increase over the previous 14 months. Remember, as interest rates continue to climb, the dollar value of notes and bonds will drop. The Bloomberg Barclays Multiverse Index reports that, over just a three-week period between September and October of this year, $1 trillion in bond values were erased. While we're not predicting the next market crash just yet, it's important for every investor to have a plan in place for when it happens.